How was your Christmas? Mine was surely great & I got a lot of awesome presents! I will definitely make a Christmas post on Sunday, as I am going to visit my cousins this weekend & I will surely take more Christmasy pictures there! But regardless of that- it is another Friday, which means another Ebay bargains post! Luckily the past 3 days were given me as holidays and therefore I didn’t had to work on Christmas- how awesome is that? So as I was just chilling and relaxing throughout my holidays, my mind was starting to wonder about Holiday destinations & as there is no snow in Latvia, I was imagining what I would love to wear if I had the chance to go to a fancy ski resort (like the ones in Aspen, Colorado, USA). 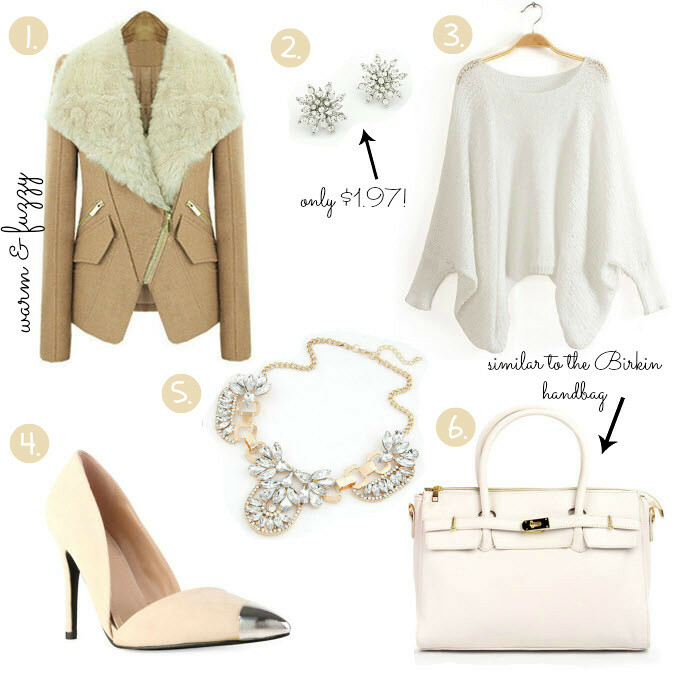 The color scheme I have chosen is light brown & white, because I think these colors when combined can make an impression of expensive clothing & accessories (even though all of these items can be found on Ebay for relatively low prices!). Other favorite of mine is that beautiful, beautiful necklace. You can definitely say that statement necklaces are my weakness, if I would have enough money to spare on ebay shopping, I would have already ordered it, but as I don’t have that much money to spend on accessories or clothing, this will have to wait till next month’s wage! Do you like my bargains? Which is your favorite? You can see my other Ebay posts HERE! lovely choices, especially that coat! I love the picks, the fur trimmed jacket is just gorgeous!!! You are so good with these EBAY choices, what a great eye you have, Enjoy Maddie, hope you so much fun! ohh that first jacket looks amazing! I love the zippers and the fur! All of these are absolutely gorgeous! I love shopping eBay. Online shopping has such good deals sometimes. I adore 5 and 6. Love the collection. Great post. Wonderful selection, I love the coat. Happy weekend my dear! lovely choices <3 thanks for sharing them! This look is so fab! LOVE it! Awesome, friend! Thanks for visiting my blog! 🙂 And leaving a nice comment! PS: I'm a big fan! It'd make my day if you follow me on gfc and bloglovin! I'd jump up and down if you do! Hi Maddie, beside that coat being absolutely chic, your choice of bling is exquisite, I want that necklace and heels, so pretty! Hope you're having a wonderful weekend hun! Love the soft color of this items!! The coat is perfect!!!! Great finds! That jacket is incredible! Hope you have a great time at your cousins!!! I love the items on your list =) Especially the coat and shoes. these look amazing, great pieces! I need a bag like that. I love structured bags! Maddie, I hope you had a lovely Christmas and may all your wishes for 2014 come true! All so beautiful, especially in that colour scheme. I love the coat the most. It looks so stylish warm and cosy. Wishing you all the best for the new year. Thanks for this year of your friendship and amazing posts. I love the coat and the necklace!! Ciao MAddie, the shoes and the coat are fantastic! Wish you a good New Year ! This type of post is amazing, and such an original idea! Love the selection you made, I am totally for this palette of colors. Those earrings are really cute but the heels are just wow!